Emanuela Schianodicola was born in Naples, Italy and resided there until the age of twelve. She immigrated to Brooklyn, NY and lived there for twelve years, during which time she obtained her Degree in Travel and Tourism Management. For several years, Emanuela worked for a travel agency based in a predominately Italian community in Brooklyn, where her knowledge of Italian served as a great tool in satisfying the agency’s needs. In 2000, Emanuela and her family moved to Flanders, NJ, where she still resides with her husband and two daughters. Emanuela joined the ISNJ family in 2013, since then she has thought youth classes from 2.5 years old and up to all levels and adult classes. 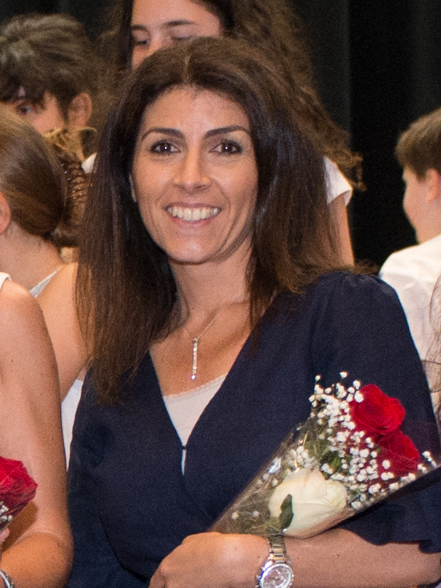 In addition, she is the Italian teachers for all levels and grades K-8 at St Bartholomew Academy,. Emanuela adores teaching her classes: her love of the Italian language and culture distinctly transpire in her lessons and drives her to perfect her teaching skills. Emanuela has helped ISNJ to improve its youth classes curriculums since she joined our team. The Schianodicola family shares her passion for Italian culture —Emanuela and her husband own an Italian restaurant in town and spend every summer vacation together in Italy with their extended families and friends in a picturesque village on the coast of Naples.